Wyndham Vacation Ownership (WVO) and Margaritaville Vacation Club won the Alliance Partner Marketing Program at the annual American Resort Development Association (ARDA) Awards Gala at the Marriott World Center in Orlando, Florida on Wednesday, April 15. 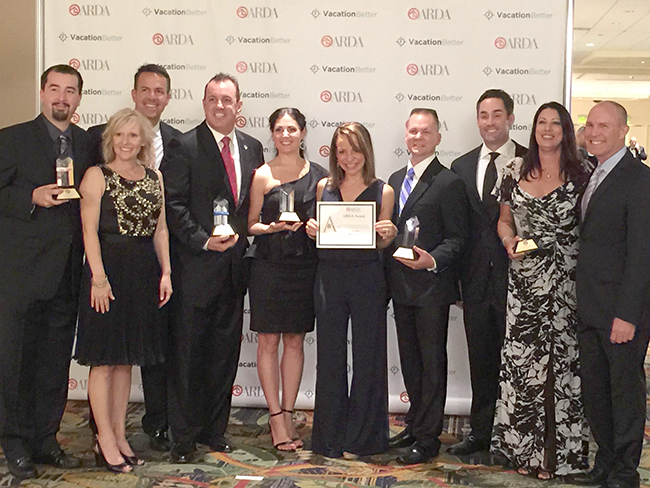 The ARDA Awards celebrate the best and brightest in the vacation ownership industry in more than 60 categories. Tamara Baldanza, CMO of Margaritaville, accepted the award with executives from WVO. Wyndham Vacation Ownership won a total of 14 ARDA awards, including the ACE Community Service Award for the company's integral role in last year's Give Kids the World "Extreme Village Makeover" where 88 villas underwent renovations at the GKTW Village, a 70-acre, non-profit "storybook" resort in Kissimmee, Florida for children with life-threatening illnesses and their families. Margaritaville Vacation Club is part of WVO, the world's largest vacation ownership company. With more than 900,000 owner families around the world, Wyndham Vacation Ownership is a leader in providing world-class lifetime vacations. Margaritaville Vacation Club is a way of vacationing designed around the laid-back, adventurous lifestyle of Jimmy Buffett and the fun and escapism of Margaritaville. A blend of enviable owner benefits, specially designed accommodations and experiences that promise changes in attitudes, Margaritaville Vacation Club isn't just a vacation, it's a state of mind. Explore the Margaritaville Vacation Clubs in St. Thomas and Puerto Rico here. Explore the Margaritaville Vacation Clubs in St. Thomas and Puerto Rico here.